SAN FRANCISCO — An Apple Inc. hardware engineer was charged by the U.S. with stealing autonomous-car secrets for a Chinese company, the second such case since July. In July, another Apple employee was accused of stealing information about the iPhone maker's robocar project to be provided to a China-based competitor. Apple has been working on an autonomous vehicle project for several years. It began around 2015 with the goal of developing a full self-driving electric car to compete with Tesla. In 2016, Apple scaled back the project to focus almost exclusively on developing the underlying software and hardware that could eventually power a self-driving car, whether that is one designed by Apple or a partner. This year, under new leadership hired from Tesla Inc., the company yet-again scaled back the project, shifting a couple hundred of its employees from the autonomous software team to its other artificial intelligence teams inside the company. According to the latest theft case, Apple has approximately 1,200 employees working on the autonomous vehicle project, which is known internally as Project Titan. 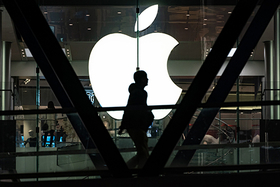 An Apple spokesman didn't immediately reply for a request for comment on Chen's case. Chen's attorney didn't immediately respond to phone and email requests for comment.